whats the difference in sound and feel? is there a big difference in feel because ive been playing at 22" for 7 years and im thinking of getting a 24" bass drum on my new kit. Not a whole lot of difference feel wise the only difference is your bass drum pedal beater will have to be a little bit longer if you want it in the middle of the bass drum and that could feel a little different. Sound wise just a little deeper tone thats all. You would probably find yourself tuning it just a little different than the 22" as well. The difference is bigger than you might expect. They sound monstrous. Shakes Bar rooms and carry really well un-mic'd. Feel wise it can be a little slower on rebound. I wouldn't really advise you buy one if you play fast kik patterns all the time although it's not impossible of course. Better for big fat grooves really. Recording 24"s is fun and I've had some amazing results, but can be too deep and flabby or boomy for most applications. Un-talented or noob sound engineers run and hide when they see you carry it in. They bring up your Tom height by 2" inches of course. Or if you have your Tom on a Snare stand then you'll find it will be moved outward by 2". Try re-setting your current set up to see if you'll be comfy with it. I do tend to sit higher when I get my 24" out. Makes playing acoustic Jazz much harder. Makes playing Rock easier. A bit of a pain to carry about, heavier. If you get a 24x18 you may want to check you can fit it in your car first. Don't worry about changing beater heights, well I don't anyway. I have 20",22" and 24" kiks in my drum collection and I use the same pedal and settings for all. Why not go DW or custom and get a 23 like peart did? Apparantly it has a big sound like a 24 but is tight like a 22. Only catch is that the only company that makes 23 heads is remo i think. bass-ackwards wrote: Why not go DW or custom and get a 23 like peart did? Apparantly it has a big sound like a 24 but is tight like a 22. Only catch is that the only company that makes 23 heads is remo i think. I would love to try one those out on a gig or two. Steaky wrote: Feel wise it can be a little slower on rebound. I wouldn't really advise you buy one if you play fast kik patterns all the time although it's not impossible of course. Better for big fat grooves really. I agree with ya on everything except about the rebound and that it is slower. That all has to do with how you have your bass drum tuned, the common misconception about bigger bass drums is that most people will tune it the same way they do with the smaller bass drums and that is when you will have these problems. Bonham use to tighten his heads really tight with a big bass drums because the air in the bass drum has a farther distance to travel that is also why he would never use a port hole in his reso head as well. But seriously experiment with it and find out what you like best, my personal opinion would be go with the 24' you will like the difference. I've played 24" basses many times, in fact I've played 28" base drums in my grandfather's orchestra. There is a difference in feel, sound and rebound of the beater. I really like the thunderous sound of the 24" base. 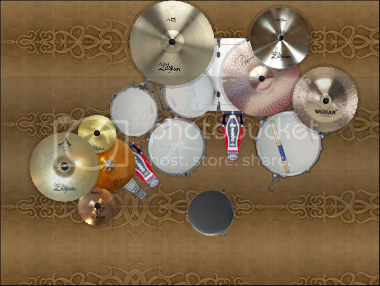 What I don't like is how and where I have to place my rack toms because of the increase in diameter of the base. I run with two and sometimes three rack toms. I Just have problems adjusting the height between the rack toms, floor toms and my drum throne. It feels as if I'm on a ladder. If I played with just one rack tom to to the left or mounted to the bass it wouldn't be much of a problem. I agree with WMPdrummer13, as he pointed out you can tune up and out some of that flab, but beware of beater flutter if you over tension loosing all that solidity and secure thump. For quicker response look at 24x14, the relatively thin depth will give you ample return as the Air won't have so far to travel back and forth inside the drum between the heads, and in fact if you are used to playing 22x16 or 18's, a 14" depth will probably compensate for the feel change in the diameter and present no problem to you at all, just more BOOOOOMMMMMM!! Anyway don't listen to us, go find one and try it out. Oh and when you do, please come back and tell us how you felt about it and wether you liked it. I use both at times. My Gretsch has a 18x22 my PDP has an 18x24. I find that the 22 is easier to tune and for some reason, I seem to get a deeper tone out of my 22". It could be the shell construction (thicker versus thinner shells) I'm still working with the 24 as I haven't had it for very long. I used to play a 26" back in the 70's. One thing I have found is that the larger drums require more tension in order to get a decent amount of punch. My old kit (still have it) has double bass (20" & 22") drums. My newer Yamaha kit has a single 18" x 24" virgin kick. I love the sounds I get from this drum, and doubt I would go back to smaller sizes. That being said, I have 5 toms in my set up.....8,10 & 12" above the bass drum, and 14 & 16" floors. I did have to raise my 12" tom a little higher than normal to clear the bass drum, but it wasn't a major adjustment. For those with multiple toms who tend to set them up low, it would definitely be an issue. Yamaha Maple Custom Absolutes, Paiste cymbals. I don't really like 22" kick drums. I like my kick drums either small or big. I use both a 20" and a 24", switching between them depending whether I'm playing a louder or quieter gig. 24" kicks sound like THUNDER. Gobs of low end, huge boom. My 20" is kind of boomy too, due to the fact that I don't muffle my kicks any further than using a batter head with a small bit of muffling around the edge. You can increase rebound speed by tuning the drum higher, but it's never going to be as quick as say a 20". That being said, I used to play extremely fast double bass patterns on my 24" when I played grindcore and death metal on a regular basis, and it wasn't a big deal. I do have to set my rack tom up higher when using my 24", but it's not a big deal to me. Alan_ wrote: I don't really like 22" kick drums. I like my kick drums either small or big. I use both a 20" and a 24", switching between them depending whether I'm playing a louder or quieter gig. 24" kicks sound like THUNDER. Gobs of low end, huge boom. My 20" is kind of boomy too, due to the fact that I don't muffle my kicks any further than using a batter head with a small bit of muffling around the edge. You can increase rebound speed by tuning the drum higher, but it's never going to be as quick as say a 20". That being said, I used to play extremely fast double bass patterns on my 24" when I played grindcore and death metal on a regular basis, and it wasn't a big deal. That's pretty much my sentiments. I burned out on 22" kicks and sold mine off, but still play a 22 from time to time with backline or shared kit situations. I love how a 24 really rumbles and projects that low end really far into the room. It's ideal for times when you are not mic'ing up.